Funded in FY2018 through the National Fish Habitat Action Plan. The Nature Conservancy is working with partners to remove the Columbia Dam on the Paulins Kill. This project will open approximately 20 miles of streams to migratory fish, including American shad, river herring, sea lamprey, and American eel. It will also improve in-stream habitat for resident fishes and macroinvertebrates, and improve water quality in the former impoundment. 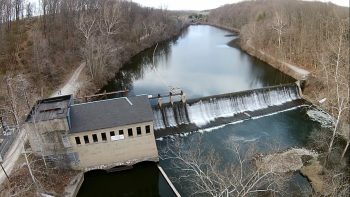 The Columbia Dam is located less than 0.25 miles upstream of the confluence with the Delaware River, and is currently a complete barrier to fish passage. Text and photos provided by The Nature Conservancy.